The gold illusion is that paper gold actually represents solid gold whereas in fact the two are as far apart as Melbourne, Australia is to London, UK. In the report ‘I’ stands for issues, where the company parted with solid gold. ‘S’ means Stops and indicates where the company takes delivery of the gold. ‘C’ means customer’s accounts and ‘H’ signifies house accounts. You will see that most transactions end up at zero, meaning that there has been n-0 movement of actual gold. If any was delivered on a day it was gotten back that same day. Some of the companies, it can be seen receive more gold than they deliver, others less. Goldman Sachs, however, does not change one iota. Despite crying about, how gold the devils brew, it has not relinquished one golden ounce of the stuff this year to date. J. P Morgan, on the other hand, has relinquished 1,966,00 troy ounces of gold over the past 3 months. 74 percent more than all the gold the US mint delivered in 2012 in its American Gold Eagle program. (Note Feb, March and April). Yet, a report by Tekoa Da Silva indicates that the Comex Depository Warehouse Gold Stocks have been depleting over the past three months. This does not gel with the Comex report and it makes one wonder if there is any gold in the Comex at all and I cannot get rid of the notion that this is a way of destroying the gold illusion and preventing customers from demanding their gold be redeemed as the comex never actually had any physical gold in the first place and now it can be said to be almost true. Meanwhile, while the US government is working furiously to bolster confidence in the US Dollar, across the waters Europe and Asia are taking full advantage of the contrived foot on the price of gold and buying it up. 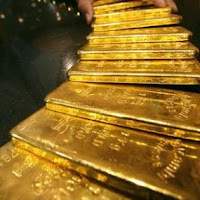 In New Delhi the gold retailers are paying over the top in order to mean increasing demand. as customers grab every ounce of gold they can lay their hands on. Retailers are paying 8 to 10 dollar premiums an ounce over and above the international gold price, 4 to 5 times the average in normal peak times. "We have not seen this kind of premium on gold imports in years," said Suresh Hundia, president emeritus of the Bombay Bullion Association. In Dubai it is a similar story. Frantic gold buying since April the 12 has pushed up the premium retailers have to pay to ensure they retain sufficient stock in this real gold rush with premiums touching 5 dollars an ounce. The manic buying of gold jewellery at local shops since April 12 is now pushing up the premium retailers need to pay to ensure they have enough stock coming in on a daily basis. In New York the US Mint has suspended further sales of its one tenth ounce American Eagle gold bullion coins due a ‘depleted’ inventory giving rise to the notion that there is not as much gold in the US as first thought. Michael Kramer, president of Manfra, Tordella & Brookes (MTB), a major U.S. coin dealer in New York, says they have been inundated with orders from existing and new wholesale and retail customers. "It's panic. This is one of the busiest times in quite a while. People think gold's at the lows and they want to take advantage," he said in an interview." The gold illusion is breaking down. (In the chart, the February 1 to April 25 delivered gold contracts includes only transactions between Companies. For that reason MorganStanley’s 307 contracts transferred from house account to customer account was excluded from the calculations.